Harvard Medical School has been awarded a $100 million grant from the National Football League Players Association to create a 10-year initiative for the study of injuries. “Our goal is to transform the health of these athletes,” said Lee Nadler, HMS dean for clinical and translational research. The National Football League Players Association (NFLPA) has awarded Harvard Medical School a $100 million grant to create a transformative 10-year initiative — Harvard Integrated Program to Protect and Improve the Health of NFLPA Members. The program will marshal the intellectual, scientific, and medical expertise throughout Harvard University to discover new approaches to diagnosing, treating, and preventing injuries and illnesses in both active and retired players. Professional football players often develop severe disability related to a number of health problems, including head trauma, heart problems, diabetes, and joint and other skeletal injuries, as well as psychological stress. Americans have become increasingly concerned about the risks posed by participation in contact sports. The program’s goal is to improve the health and well-being of NFL players, while further elucidating the risks of participation in American football. The researchers will develop strategies for preventing injuries, illness, and the undesirable consequences that sometimes result from participation in contact sports. Developing these strategies will require an intimate understanding of the specific needs of professional athletes. The program leadership team represents all the critical domains of knowledge and skills necessary for success. Joining Nadler as co-director is Ross Zafonte, Earle P. and Ida S. Charlton Professor and chair of physical medicine and rehabilitation at Spaulding Rehabilitation Hospital, Massachusetts General Hospital, and Brigham and Women’s Hospital. Associate directors will be William Meehan, director of the Micheli Center for Sports Injury Prevention, assistant professor of sports and emergency medicine, and director of the Sports Concussion Clinic at Boston Children’s Hospital, and Alvaro Pascual-Leone, HMS associate dean for clinical and translational research, professor of neurology, and director of the Berenson-Allen Center for Noninvasive Brain Stimulation at Beth Israel Deaconess Medical Center. “Our partnership with the NFLPA will contribute to transforming our understanding of the effects of physical demands, emotional stress, and repetitive trauma on disease. We are excited about the contributions this extraordinary partnership will make to NFL players, the community, and the knowledge base of medicine,” said Zafonte. In order to ensure a thorough assessment, experts from a range of fields — including epidemiology, genetics, metabolomics, lipidomics, cell biology, neurobiology, regenerative medicine, neuroscience, imaging, and computational biology — will participate in this program. Researchers plan to immediately partner with NFL players themselves, identifying a group of at least 1,000 retired athletes from across the country. From this group, researchers will identify 100 healthy and 100 unhealthy players, and through a series of tests and examinations create what the researchers describe as a “biological profile of illness.” Such a comprehensive study of football players has never been done before. An effort of this magnitude is critical to developing novel tests that can detect the earliest signs of problems in active players, and to investigating interventions to prevent them. “We will immediately launch a number of innovative clinical trials to test new interventions for treating major health problems of NFL players,” said Meehan. These will include a method for regrowing anterior cruciate ligament, or ACL, tissue; advanced imaging techniques to measure and assess heart function; and new approaches to directly treating concussion injuries. These and other projects are designed to yield results within the first few years, and will be followed by similarly innovative studies, identified through competitive academic challenges issued to researchers throughout Harvard and beyond. Researchers will be challenged to discover new risk factors, identify novel preventative measures, and develop innovative therapies. The key to the success of this initiative will be the partnerships among researchers, NFL players, and players’ families. Through ongoing “listening tours,” researchers will gain firsthand knowledge of players’ lives and experiences. Members of the Petrie-Flom Center at Harvard Law School will help address ethical, legal, and policy issues relevant to players. 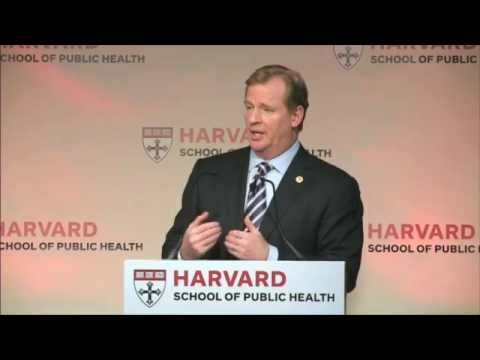 In November of 2012, Roger Goodell, Commissioner of the National Football League, spoke about player safety in both the NFL and youth sports at The Dean’s Distinguished Lecture at HSPH. A sample of the hundreds of dental images collected during the 21-month photographic study.